Claudia, single mother of two young children, pines for her past independent life. Her ex, after all, has moved on to a new wardrobe, a new penchant for lattes--and worst of all, new adult friends. But in Claudia's house she's still finding bananas in the sock drawer and cigarettes taped to wrestling figures. Then Claudia receives the unexpected news that her mother has died. Shared through the hilarious, honest, and often poignant perspective of a single mother, Roost is the story of a woman learning about motherhood while grieving the loss of her own mother. And as she begins to mend, she's also learning that she might be able to accept her home--as it is. I seem to be on a kick of reading Canadian authors lately and I am very glad that I discovered Ali Bryan. I loved the references to things Canadian (and from the Maritimes) as it gives me a little thrill when our great country is the setting of a great book! Perhaps because I am a new mother, I found I could really identify with a lot of the feelings that were expressed in this book. A lot of the things Claudia felt were probably things that every mother feels, with the added complication of losing her mother in the midst of discovering how to be one herself. 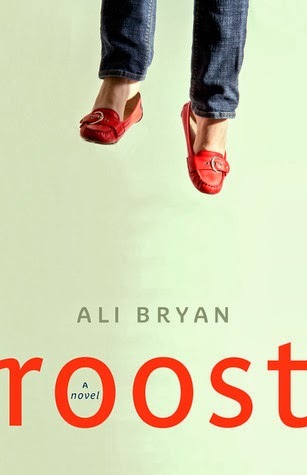 Roost was one of the most down to earth, easy and yet difficult and touching books I have read this year, perhaps ever. I am fairly sure that most people would be able to find themselves somewhere in the story. I can't pretend that I know how losing a parent feels but with one parent who is quite ill, I can imagine and empathize with her position. Having to hold the family together when it isn't necessarily natural or easy for you? Been there, done that. Lost it on my child and then felt bad afterwards? Check. Sibling rivalry? Oh yeah. Roost sounds like it might be a serious read but I have to say that though it does deal with a fair amount of serious issues, it is truly hilarious at times. Perhaps a little tongue in cheek even but definitely entertaining. Ali Bryan is a fantastic author that I cannot wait to hear more from. I hope her next books are as entertaining and are published soon! Thank you to Freehand Books for our review copy. All opinions are our own.